Multiple roof lines and unique placement on its wooded homesite makes the architecture of this Michigan home command attention. The 3,300-square-foot, four-bedroom Deer Haven home provides a perfect example of the energy efficient advantages of Insulspan SIPs. When combined with other green building features, SIPs can create a LEED® certified home. The architecture embraces the owners’ close relationship to the outdoors as do the (sometimes unseen) inner workings. As an example, the residence includes a flat roof area over the kitchen to accommodate a live green rooftray system. The tray system’s installation allows for thermal mass [ii] and also controls water runoff. When combined with other green building features, SIPs can create a LEED® certified home. Mathison Architects notes a few items on its website as Deer Haven’s “Keys to Success” in its quest for LEED® Platinum certification. The firm includes, Wall Insulation: Structurally Insulated Panels, as one of those keys. This is important to Insulspan because Mathison Architects is a professional firm committed to the use of biophilic principles. The core principles of a biophilic design integrate natural light and air into a building. This creates a healthier environment for a home’s occupants. It’s a philosophy of design that perfectly combines with Insulspan’s building products. 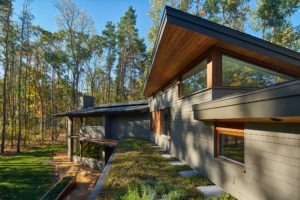 Mathison Architects applied for, and received, LEED® Platinum certification for the Deer Haven home. Coupling their design philosophy and the home’s numerous energy saving features with the R-25 SIP walls [iii] and R-38 SIP roof panels provided by Insulspan, made a tremendous impact in the certification process. Platinum level certification requires 80+ points; this home received a stunning 96.5, including 19/21 for Indoor Environmental Quality. Finally, in addition to saving on energy costs without sacrificing style, building with SIPs increases the speed of the construction. The latter benefit can’t be emphasized enough according to Munn. Made from a layer of expanded polystyrene (EPS) foam insulation between two boards of oriented strand board (OSB), SIPs make the home’s framing and insulation a one step installation process, by only one subcontractor. Consequently, this shortens the time it takes to erect the building’s structural shell. Read about another LEED® certified home, this one in Vancouver, British Columbia. [iii] Deer Haven’s 6 ½” SIP walls are made of two pieces of OSB filled with EPS and are R-25.